Map showing Atlantic canyons mapping expeditions in 2011 and 2012. The proposed operating area for the Northeast and Mid-Atlantic Canyons expedition between Cape Hatteras, North Carolina, and the U.S.-Canadian territorial boundary is shown in light grey. Image courtesy of NOAA Office of Ocean Exploration and Research. Download image (jpg, 1.3 MB). Between November 2 and November 20, 2012, NOAA Ship Okeanos Explorer will be operating in the North Atlantic Ocean, between Cape Hatteras, North Carolina, and the U.S.-Canadian territorial boundary. This expedition is primarily focused on supplementing Northeast canyon and continental slope mapping efforts carried out during previous Okeanos Explorer cruises as part of NOAA’s Atlantic Canyons Undersea Mapping Expeditions (ACUMEN) project. The shelf break and slope off the northeastern U.S. support a diversity of habitats, including more than 70 canyons ranging from depths of approximately 100 meters to 3,500 meters. The topography, currents, and sedimentation in and around these submarine canyons can be quite complex, creating “biodiversity hotspots” which support a wide variety of species including unique deep-water corals and commercially relevant fish stocks. Although a limited number of these canyons have been studied previously, most are poorly known and are of significant interest to regional stakeholders as well as federal and state agencies with research and management responsibilities. 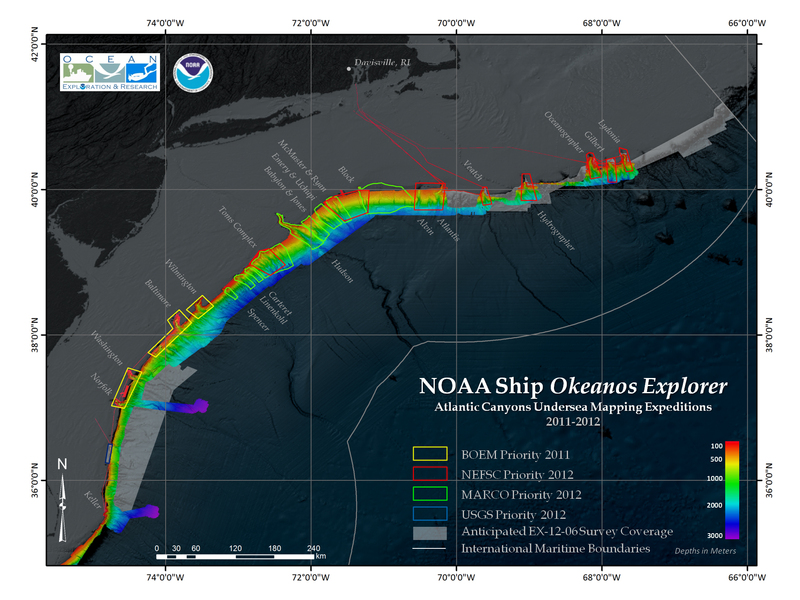 When combined with previously collected Okeanos Explorer data, survey mapping conducted during this expedition is expected to result in near-complete bathymetric coverage of the seafloor from the 200-meter contour to existing Extended Continental Shelf (ECS) data between Cape Hatteras and the U.S.-Canadian territorial boundary. Additionally, this expedition will yield seafloor backscatter, water column, backscatter, and sub-bottom profile data within the planned survey areas. Data from this and preceding ACUMEN expeditions will be used by the NOAA Office of Ocean Exploration and Research, NOAA National Marine Fisheries Service, and other NOAA science partners in planning Okeanos Explorer telepresence-enabled remotely operated vehicle expeditions to continental shelf canyons scheduled for the summer of 2013. During the expedition, multibeam and single-beam sonar data will be collected 24 hours a day. Sub-bottom profile data will be collected between the hours of 1000 and 1800. Expendable Bathythermograph (XBT) casts will be conducted at an interval defined by prevailing oceanographic conditions, but not to exceed six hours.